*Assuming that the money was deposited directly in the firm’s bank. Loan received from a bank may be payable in short-term or long-term depending on the terms set by the bank. The repayment of loan depends on the schedule agreed upon between both parties. A short-term loan is categorized as a current liability whereas a long-term loan is capitalized and classified as a long-term liability. Loan received via direct credit from ABC Bank for 1,00,000 for new machinery. Show journal entry for this loan taken from a bank. 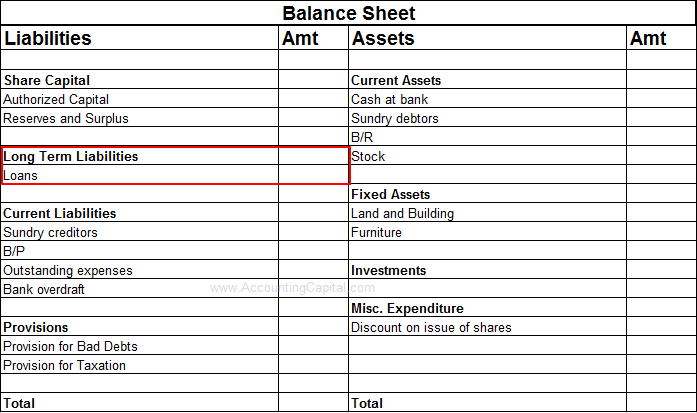 As per the accounting equation, Total Assets of a company are the sum of its Total Capital and Total Liabilities. In the aforementioned example total assets of the company increased by a hundred thousand and simultaneously their liabilities grew by the same amount. The example above doesn’t have any impact on the equity of the company. Procuring a loan means acquiring a liability, it is an obligation for the business which is supposed to be repaid. Long-Term loans are shown on the liability side of a balance sheet. >Read What is a Contra Liability?